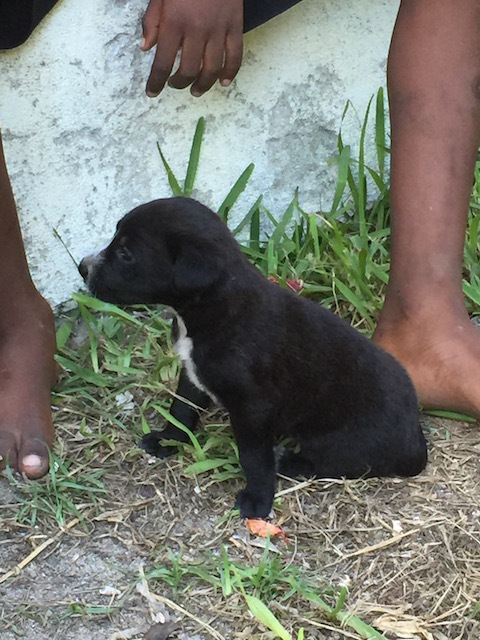 So we found our new potcake love story right here in Eleuthera…. Well more accurately in Tarpum Bay …. 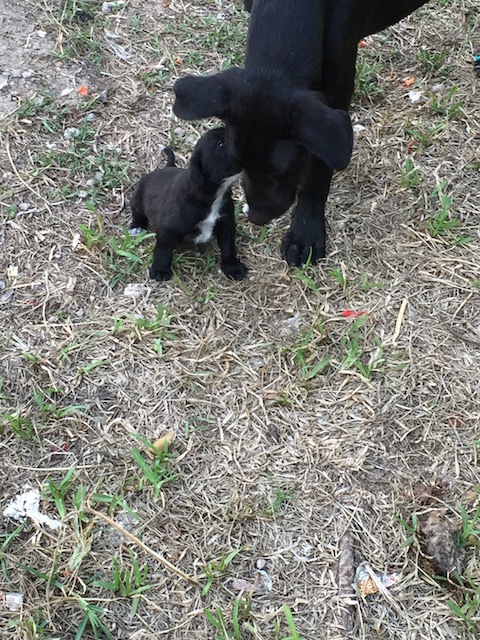 As I said in last week’s blog we were starting to look for a new puppy. 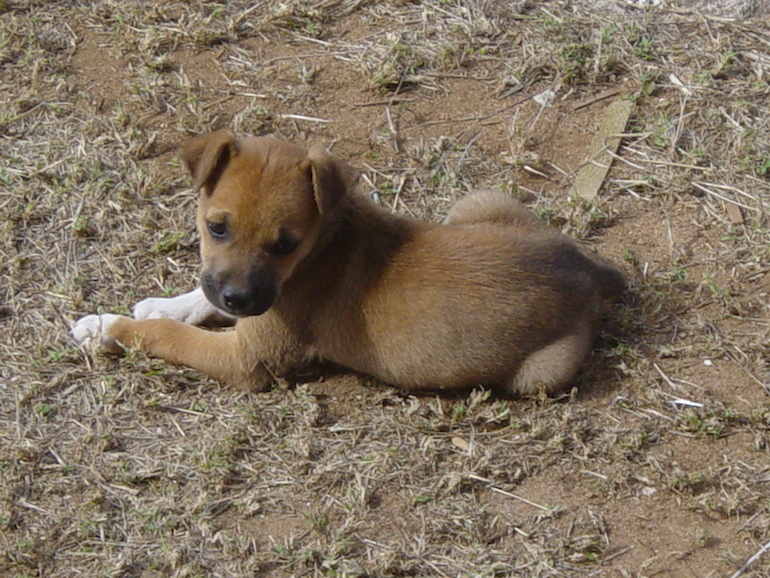 It is six months now since our very special potcake Joe Loius died and although he will be impossible to replace, for both Bob and I, a house is not really a home without a dog, so the search began. After a couple of false starts we heard about a litter of puppies in Tarpum Bay so one evening this week we drove down and found them. 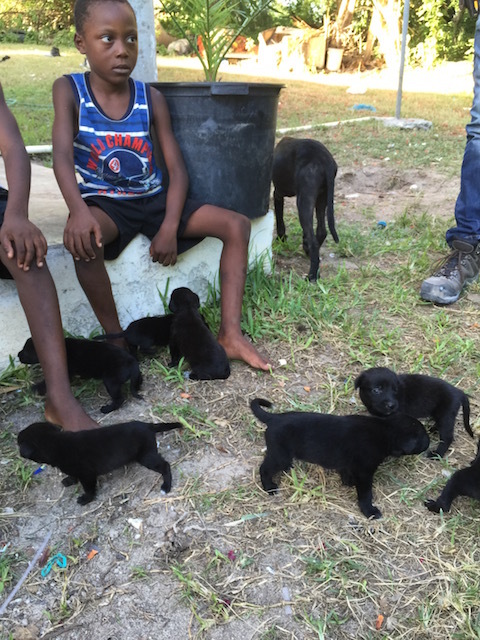 They were a litter of 8 puppies – but I was adamant that we only wanted to have ONE ! Mustn’t squeeze him too hard !!!! 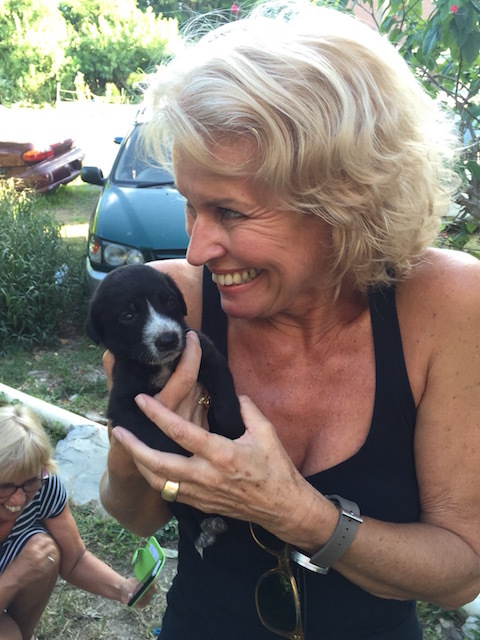 I love that Jane is crouched down in the corner not knowing whether to take another picture or play with the puppies ! We have a name for him as well – Rudge – after a character in a favorite film of mine called The History Boys. The film is about a group of young men all studying to get in to either Oxford or Cambridge University – obviously set in the UK and written by the brilliant playwright Alan Bennett. He writes with the most wonderful humor and observation and I have been a big fan of his different works for a long time. If you get the chance to see the movie then do – Rudge comes out with one of my all time favorite lines – he is asked in a mock interview to define what history is – and even now after watching it umpteen times it still makes me laugh out loud. But I’m not going to tell you what he says – you have to find out for yourselves !!!! Suffice to say that it is blunt and to the point ! On the subject of favorite films – and books for that matter – we have just watched a really lovely and loving documentary about a New York photographer called Bill Cunningham. He had a fashion column in the new York Times and was a well loved and respected man in the fashion field – not something that happens that often. He documented street fashion and trends – unusually for these days he ignored celebrity – do catch it if you can. It is called Bill Cunningham New York. He died on June 25th this year aged 87 and it was as a result of reading his obituary that I found the movie….. Highly recommended. Joe Louis when we first got him ! I have also just read 2 books by the same author that some of you may be interested in. Loving Frank by Nancy Horan and Under The Wide and Starry Sky. They are both fiction – but based on the true stories of women who had relationships with Frank Lloyd Wright – the architect in Loving Frank, and Robert Louis Stephenson, the writer, in Under The Wide and Starry Sky. Thanks to Mona for recommending Loving Frank to me ! What’s happening in Governors Harbour – end of the season…..
Oh, a new baby! I can’t wait to meet Rudge! I know he will be sweetie! Lovely to hear from you – hope you saw your name check with regard to Loving Frank ! So glad you found a new fur baby to love! Me too ! Thanks …..
OMG! Tooooo cute. We totally agree, there’s nothing like a new puppy to fill your heart with joy. Regards from Long Island. Thanks so much – yes I could eat puppy pie !!! It is amazing the response when it is about dogs – so pleased so many of us are united in our love of them ! Love the white markings…like a tuxedo cat. You are fortunate to get a black potcake. I bet you’ll be getting a fluorescent collar for nights. Can’t wait to make its acquaintance. I was an NYT fan of his forever. In fact, I saved the tribute edition to him and his camera eye. He is irreplaceable (like JL) and the new column lacks his panache, not to mention his generous collage of photos! I will lend you the DVD to watch when you come over here…… So pleased that you are getting these comments through now ! Thanks! I will look forward to watching it. And, I’ll bring the article! Can’t wait to meet darling Rudge! We will be on the island in September. What a cutie pie…..can’t wait to meet him. And, I’ll bring the article for you! And, I’ll bring you the article!